I'm currently working part-time on trying to decide on the best way of presenting my data collection. Currently there is a Facebook Page with a few snippets and discussions that your welcome to join. It probably won't come as too big a surprise to you to find that I am in fact a GREENWOOD. 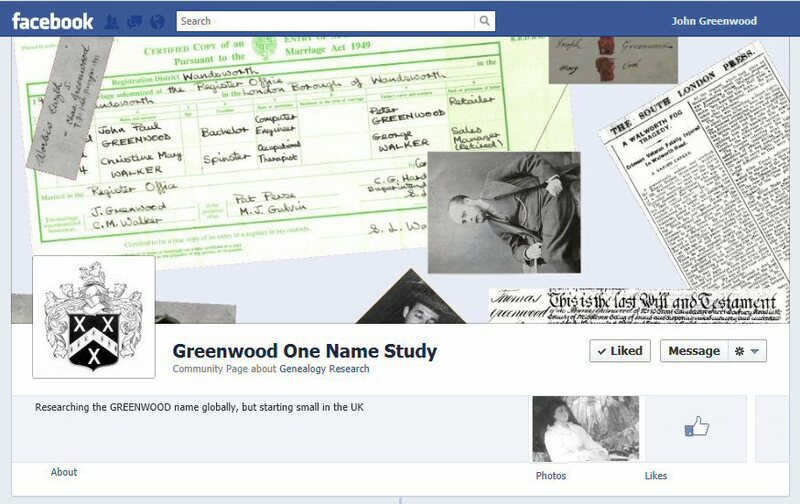 But what is unusual is the fact that not only was my father a GREENWOOD, but my mothers maiden name was also GREENWOOD. You'd have thought this would have made my own family research simpler, but that doesn't seem to have been the case. I started researching my family in 1997, just after the birth of my son (what is it that triggers the urge to find out about ancestors when a new generation starts?). This continued at a reasonable pace until I started talking to other unrelated GREENWOODs online. Suddenly the information I'd collected and discarded in my own research was in demand. This along with some friendly pushing from a number of people made me approach the Guild of One Name Studies and enquire about the existing GREENWOOD study. It transpired that the previous owner had abandoned the project and had failed to 'file' any results with the Guild - hence the delay in getting anything of substance online.